There are many lakes in which to launch a trailerable boat. Lake Margrethe and Bear Lake are only minutes away from the house. Bear Lake is home to some nice trout while Lake Margrethe is known for it's Walleye population. For the more adventerous, I suggest a trip to the Chain O' Lakes - less than a one hour drive to the west. This is one on our family's favorite destinations. We launch our 19' bowrider at the Torch River public access. This gives us quick access to either Torch and Clam Lakes to the right or Skegmog and Elk Lakes to the left. Skegmog is a good bass lake while Torch and Elk are good for Lake Trout using downriggers. Also, Torch Lake has a sandbar that is great for swimming or just lounging on your boat and soaking up the rays! Elk Lake is my favorite for swimming and skiing or wakeboarding as the water is not as cold as Torch Lake. Not too far to the south of Grayling are Houghton and Higgins Lake which are also great boating destinations. The following Canoe Livery on the Manistee River is 2 miles from the house. Rates are reasonable and floats can last from 2.5 hours to several days depending on your needs. Give Todd or Nick a call to pre-arrange your trip. We are located on the Beautiful Manistee River - Camping Facilities • Friendly and Efficient Service • Weekday Specials • Snacks & Souvenirs - Flowing all the way to Lake Michigan, the Manistee offers great canoeing for both novice and experienced, with 225 miles of beautiful scenery, wildlife, and excellent trout fishing. Look for the A-Frame by the Manistee River on M-72, 8 Miles West of Grayling. 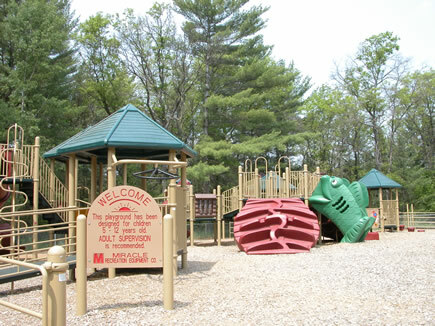 For those of you with little ones, there is a very nice play area just across the street from the Fish Hatchery in Grayling. You will find the equipment well taken maintained. There is a very clean restroom and a covered picnic area as well. 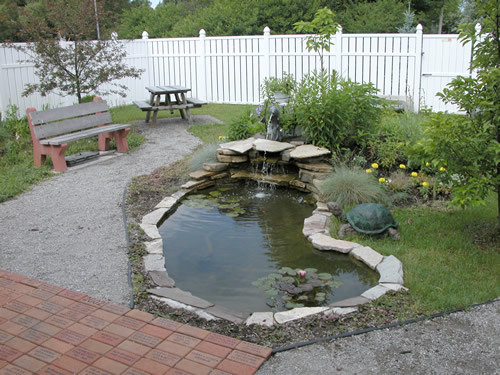 There is a small courtyard with a pond that makes a great place to sit and read. As much as I enjoy the Manistee and AuSableRivers, sometimes I like to come to this library to peruse the literature, surf the internet, find DVD's and VCR tapes or just sit in the courtyard and listen to the gentle water fall while reading a great mystery, biography or classic tale. Monday - Saturday: 10 a.m. - 1:30 a.m.
Sunday: Noon - 1:30 a.m.
Take out until 1:30 a.m.
Home of the "Lumberman's Breakfast"
Be sure to try their Blueberry Pancakes!!! There is a large herd of Elk in Northern Michigan that can be found East of Gaylord. One of the best places to see and photograph Elk, as well as gain some historical information is to be found in Hillman, MI at Thunder Bay Resort. In the Winter you can arrange to take a Sleigh Ride to see the Elk and also enjoy a Gourmet Dinner cooked in wood burning stoves. AuSable River Canoe Marathon - Michigan's most prestigious and richest Canoeing Event - Over $50,000.00 in Cash and Prizes! For over 50 years this race has attracted people from all over the World. It has traditionally been held the last full weekend in July and starts at Ray's Canoe livery in Grayling, MI and finishes 120 miles later at the AuSable Inn & Finish Line Sports Bar in Oscoda, MI. The racers begin several blocks away from the river and at the sound of the starter pistol they run with their canoes to the river. It's quite a sight to see them throw themselves and their canoes into the river, sometimes flipping over before they even get started. It takes no more than a few minutes for them to be out of sight and the crowd scrambles to their vehicles in order to get to the first check point to see just who has moved into first position. Many of the crowd continues to follow the racers all night long and are there to greet the finishers as they come under the bridge in Oscoda -- in the morning. All are know for great color. Peak Season ranges from the second to fourth weekend in October depending on the frost conditions. There are many shops in the area to help you with your fly fishing needs. For lessons, rods /reels and fly tying supplies try the Fly Factoy in Grayling. Steve Southard will be happy to help you with everything needed to fish either the Manistee or the AuSable. Gates AuSable Lodge located at 471 Stephan Bridge Road is another place that you will want to stop. Rusty Gates is well known for his knowledge about the AuSable River System and his flyfishing expertise. He was Fly Rod and Reel's "Angler of the Year" in 1995 and is active in The Anglers of the AuSable. Established in 1924 as a 9-hole course, the Grayling Country Club(GCC)is one of the oldest in Michigan. However, in 1990 a second nine was added to complete the 18-hole track; the original 9-holes now lay scattered among the front and back nines. Nestled along the beautiful AuSable River in downtown Grayling, the GCC is open to the public and offers a complete list of amenities to meet your golfing needs including: putting greens, practice range, practice bunker, chipping green, lessons, bar/lounge, snack bar, complete pro-shop and sandwich menu. Located just 40 minutes shy of the Mackinaw Bridge on interstate 75, Black Bear is easily accessible and a founding member of the prestigious GAYLORD GOLF MECCA, which is known to many as the Golfing Mecca of the Mid-West. Several golf packages can be easily coordinated with any lodging facility in Gaylord and all surrounding cities. We understand golfers want a great product at a reasonable price, call one of our courteous professionals to create your dream golf vacation now. Of course you can always take a walk or hike down the back roads near the house. There is a lovely dirt road that meanders along the river for 10 Miles and ends at the CCC Bridge -One of the best trout fishing spots on the Upper River during the Hex hatch. Directions: Deadman's Hill is located off US-131, 11.5 miles north of Mancelona or 6 miles from the hamlet of Alba. From US-131 turn west onto Deadman's Hill Road and follow it for 2 miles to a parking area at the end. Notes: The end of Deadman's Hill Road is a loop and includes a small parking area and the trailhead for the Jordan River Pathway, marked by a large trail sign and a box to leave your hiking plans. Before arriving, fill up your water bottles. There are vault toilets at the overlook but no drinking water. Many, if not all, Cross Country Ski Trails are open to Summer Hiking. Here are a few that make great hiking trails in the Spring, Summer and Fall Seasons. Description: 11.5 miles, rolling to slightly hilly terrain, hiking, skiing, camping. Directions: 15 miles East of Grayling on M-72; 12 miles East of Grayling, South on Chase Bridge Rd. 10 miles to South Branch Au Sable river Bridge. Note: Biking is prohibited on this trail. If you go early enough in the day you are likely to see deer and other wildlife. Description: 10.1 miles, flat terrain, hiking skiing, camping. Directions: At East end of Tisdale Rd., 5 miles East of Roscommon on M-18. Description: 1.5 miles, level terrain, interpretive foot trail, no camping. Directions: 8 miles North of St. Helen on F-97 to Sunset Rd., then East 3/4 miles to trail. Description: 8.75 miles, flat terrain, hiking, skiing, camping. Directions: West of Gaylord & South of M-32; West from I-75 at South Gaylord exit 279 on Alba Rd., 2.4 miles to Lone Pine Rd., North to end of road. Description: 7 miles, flat to rolling terrain, hiking, skiing, no camping. Directions: Between Lewiston & M-32 on Buttles Rd., take Buttles Rd. North about 3 miles to parking lot. Description: 5.5 miles flat terrain with scenic view of Marl Lake. Description: 10k groomed and wide enough for a skating lane, rugged terrain with long sloping grades and 1/2 mile downhill runs. Directions: M-33 from Mio South to 14th St, South to Cauchy Rd, then West on Cauchy Rd. Note: Trail head donations requested. Description: 16.5 miles of hiking trails; the yellow trail is 7 miles, the blue trail 5 miles, the orange trail 4.5 miles. Notes: Daily Fee. Birdwatchers would be interested in the nesting Loons, Eagles & Great Blue Heron. This is a great little fishing lake too, if you have a canoe and a canoe tote - it's a bit of a walk to the lake. It's Catch and Release only but is teeming with Bass and Bluegills. There is a Horse/Hiking Trail that winds from Empire, MI on Lake Michigan to Oscoda on Lake Huron. Access to this trail is at Goose Creek on the Manistee River just a few miles north of the house. Michigan Trail Riders Association Inc.
For a complete line of Sporting Goods try Jay's. Jay's is located in Gaylord, Michigan - approximately 25 miles north of Grayling. Species: In addition to bass and perch, Bear Lake has a good supply of trout. Species: Northern pike, large mouth bass, small mouth bass, rock bass, bluegills, yellow perch, pumkinseed sunfish. 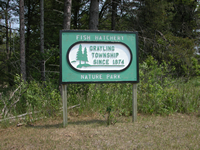 The Grayling Fish Hatchery opens each May, ready to welcome another 35,000 or more visitors. Many of those visitors will toss fish food to the thousands of brook, brown, and rainbow trout which range from 2 1/2 to 28 inches in length. Although it is a county operated facility, no direct tax moneys are allocated, so all operating revenues must come from admission fees and the sale of trout food, placing the future of the hatchery in the hands of its' visitors. 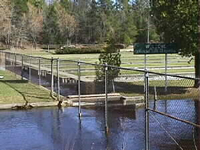 The fish hatchery is open from Noon to 6:00pm, Wednesday-Sunday, during the season. Admission Rates (2018 Season): Family Season Pass - $20.00, Adults: $5.00, Seniors/Military: $4.00, Children (5-12): $3.00, Children (0-4): Free, Fish food: $1.00 per bag. Less than 3 miles from the house is the Blue Bear Trail and access to Michigan's largest snowmobile trail system. It is possible to follow this trail system to Traverse City going West; Alpena or Oscoda, going East; as well as to the Mackinaw Bridge, going North - where your vehicle can be transported across the bridge to the U.P. for even more adventure! Click on the following link to access the map of the trail system. Note that Lake Margrethe is only 2 Miles East of the house. Grayling's Mainstreet Shopping District is a great place to spend an afternoon. You will find a little bit of everything! While your in town don't forget to stop at the Crawford County Historical Museum. While your child is at Camp AuSable, an 840 acre Christian youth camp, why not take a break. Our house on the Manistee River is the perfect Retreat. Copyright © 2017, Manistee River Retreat. All rights reserved.